Roy Cazaly’s extraordinary story is one of the great tales of Australian Football. Born in the depths of a depression, he overcame humble beginnings and personal setbacks to become one of our most celebrated footballers. His sublime skills and thrilling aerial feats made him a legend in his lifetime, with his name carried into the modern era via Mike Brady’s hymn to football - ‘Up There Cazaly’. In 1996 he became one of 12 inaugural Legends of Australian Football Hall of Fame. A relentless self-improver, Cazaly shaped the game’s development, applied his own theories to fitness, training and teamwork, and coached teams to premiership success. Away from the field, he enriched the lives of many more as a physiotherapist, horse trainer, philosopher and family man. Robert Allen’s meticulous research, gathered over 10 years, reveals in great detail the story of the man behind the catch cry. 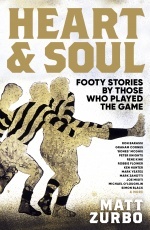 Robert Allen’s interest in writing about Australian Football began at 14, when a relative gave him a Victorian Football League scrapbook and he spent the 1982 season diligently cutting and pasting the articles that chronicled Carlton’s premiership success. 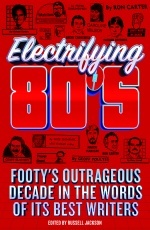 Reading background stories behind Melbourne’s tribal relationship with the game gave him his first insights into football’s great history. His love of history was further honed at high school and university and his early football writing resulted in a number of articles for the AFL Record, the Footy Almanac, Australianfootball.com and other publications. Robert’s interest in telling Roy Cazaly’s life story was sparked after he wrote an article on Cazaly’s Tasmanian football career for the Tasmanian magazine, 40 Degrees South. 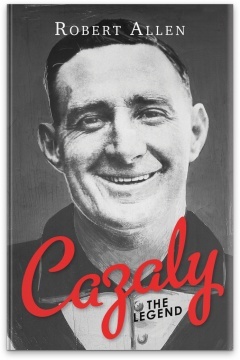 He subsequently met several of Cazaly’s descendants and decided a biography would be a fitting tribute to a man whose crowded life coincided with the growth and evolution of the game through the first half of the 20th century. Part homage, part social history, Cazaly, The Legend chronicles Cazaly’s enduring influence on our national game and the forces which helped shape the man behind the legend. Robert is a member of the Australian Football Heritage Group and co-founder of the Queensland Australian Football Forensics. He lives in Brisbane with his three children and a ginger cat named Thomas O’Malley. He still dreams of playing for Carlton. In the Round 23 edition of the AFL Record, Ben Collins reviewed Robert Allen’s biography of Roy Cazaly. Robert Allen discusses his book CAZALY, The Legend, with Gerard Whateley on Melbourne’s SEN.
A biography of one of Australian Rules’ greats has been recognised in this year’s prestigious Victorian Community History Awards. Robert Allen’s Cazaly: The Legend published by Slattery Media Group received a Commendation in the History Publication section, a category which attracted more than 50 entries. The book details the life and times of Roy Cazaly, the South Melbourne-born champion football player and coach who later became a physiotherapist, horse trainer and political candidate. In 1996 he was among the first 12 Legends inducted into the Australian Football Hall of Fame. Slattery Media Group CEO Geoff Slattery noted that Cazaly: The Legend was one of only two sporting-themed entries to be recognised in this year’s Awards, which are presented by Victoria’s Public Record Office in partnership with the Royal Historical Society of Victoria. 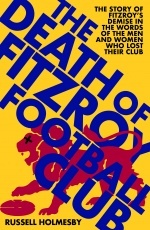 “I think the judges recognised that the book goes beyond the usual sporting biography to study the factors which shaped Cazaly and the influence he had on many others, both on and off the sporting field,” Mr Slattery said. Mr Allen said he had sought to examine Cazaly’s life through the context of the interesting and often challenging times he had lived through, including two depressions and two world wars. “This context helped chart his life through the circumstances of his family background, his sporting achievements and personal setbacks and the changing society in which he lived, worked and played,” Mr Allen said. Mr Allen thanked Geoff Slattery “for his belief in the endeavour”, Simone Egger for “her editing prowess” and Kate Slattery for “her brilliant design work”. Robert Allen discussed Cazaly, the book and the man, with ABC Gold Coast drive host Matt Webber on September 7. You can hear the interview via the link below.